Our Fruity Highlander Cocktail is a brilliant play on the classic Whisky Mac, the difference being it is very fruity! If you like your drinks fruity and with a twist of ginger spice, then this is possibly it. A simple aperitif that will be hard not to keep sipping. This is a short sipping drink, so choose a generous sized tumbler glass. Add frozen Brambles and a generous quantity of ice to the glass, then pour over the measures of Bramble Scotch Whisky Liqueur, optional Demijohn's Finest Blended Scotch Whisky and Ginger Wine. Sip slowly with friends and raise a toast to The Highlanders! How do I buy the drinks for this cocktail? If you like this cocktail then you can buy the drinks for it as part of our Fruity Highlander Cocktail Set or as single bottles by clicking on the various product links in this recipe. Inspiration for the Fruity Highlander Cocktail came from a request to donate some of our Demijohn products to an event being held in Germany in June 2014 to celebrate the safe return of The 4th Battalion Royal Regiment of Scotland (The Highlanders) from their tour in Afghanistan. So when drinking this cocktail please raise a toast to those brave men and women of The Highlanders who serve for us. We have created the Royal Rhubarb and Ginger Cosmopolitan to celebrate the magnificent Royal Wedding between Prince Harry and Ms. Meghan Markle on 19 May 2018 at St. George's Chapel, Windsor. This would be a deliciously fun cocktail to drink at any wedding reception, especially a Royal Wedding reception. This drink champions the union of an American classic with home grown British rhubarb and a touch of ginger, to give it some heat! Fill a Champagne Coupe or Martini glass with ice to cool the glass. Add your ingredients along with lots of ice to your cocktail shaker. Shake the mixture hard for around 10 to 15 seconds. Remove all ice from the glass and strain the drinks from the shaker into the glass. Decorate with a small stem of rhubarb. To make a rhubarb purée, stew fresh rhubarb stems for about 5 minutes and sweeten generously with sugar. Liquidize the stewed rhubarb with a blender into a smooth paste. Chill for an hour prior to adding the fruit purée to the cocktail shaker. 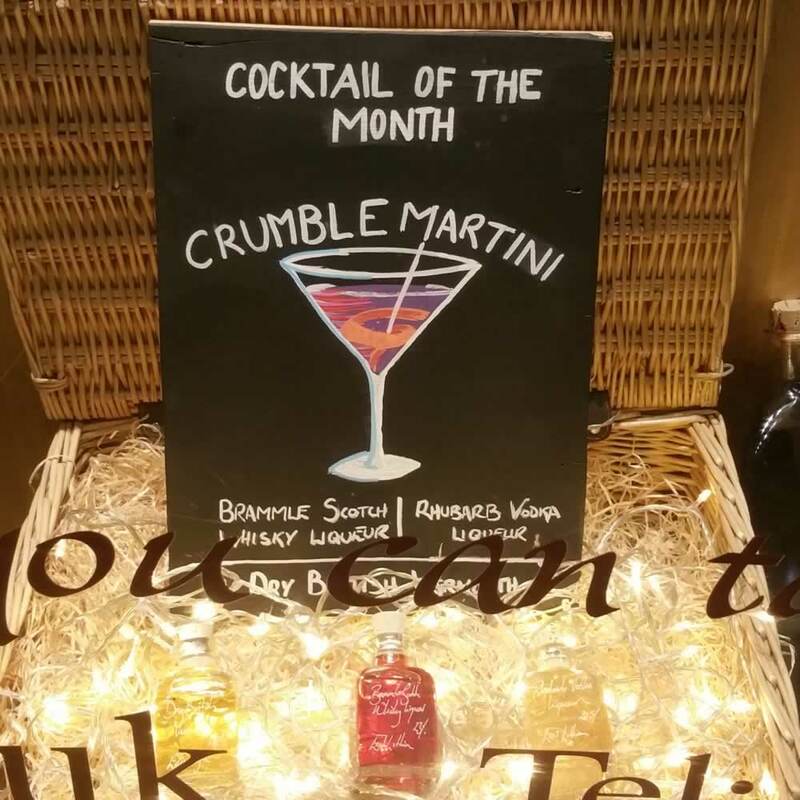 The Crumble Martini Cocktail was first created by our Glasgow Shop Team in December 2017. If you like the idea of Rhubarb or Bramble crumble, and have a quiet hunger for the odd Martini Cocktail, then we urge you to try this unique martini variation. Be warned, Martini Cocktails are devilishly strong, so drink cautiously while enjoying this potion! Fill a martini glass with ice to cool the glass. Add your ingredients along with lots of ice to your cocktail shaker. Shake the mixture hard for around 10 to 15 seconds. Remove all ice from the martini glass and strain the drinks from the shaker into the glass. Finally, twist a small amount peel from a fresh lime over the glass and drop into the drink to give your Crumble Martini a zesty twist. Our Morello Fizz Cocktail is designed an an easy, fun cocktail to get your party started! It combines our uniquely delicious Morello Cherry Brandy Liqueur simply with fizz. Add the measure of Morello Cherry Brandy Liqueur to a Champagne flute glass and top up with Champagne or sparkling wine. Add a single Morello Cherry from our Morello Cherries in Apple Eau de Vie for great visual effect and watch your party lift off as your guests eventually eat the Morello Cherry in their glass! If you are looking for present inspiration then consider our Damson and Morello gift set, perfect for those who like their Champagne cocktails as both our Damson Gin Liqueur and Morello Cherry Brandy Liqueur can be used to make delicious Kirs. Make like an expert mixologist and create this concoction, which can be purchased as our Demijohn Wibble Gift Set. It’s a bitter sweet drink that’ll warm you and your guests up in a flash. As recommended by Rebecca Twomey in Cosmopolitan Magazine in December 2009! Add the gins, grapefruit juice, lemon juice, sugar syrup and whisky to a cocktail shaker filled with ice. Shake well and strain into a martini glass. Garnish with a twist of lemon. The Martini is a simple cocktail to make. It needs to be arctic cold and it can be quite strong. Our Sloe Gin Martini is all about balance. The intensity of fruit and subtle sweetness of our award winning Sloe Gin 25%, marrying the smooth strength of our Demijohnnie Gin 50% with the incredible complexity of our handmade Dry British Vermouth 18%. Together a beautiful and delicious drink emerges. Finally, twist a small amount peel from a fresh lemon over the glass and drop into the drink to give your Martini a zesty twist. We invented our Midsummer Muddle Cocktail on a Summer evening in June when we needed a special drink to celebrate with friends. Having rained all day and with just 20 minutes prior to the first guests arriving at 6pm, the sun finally came out. We decided it was time to be brave and create a new cocktail drink for the new Summer conditions and moved the whole party outside into our garden. Our Midsummer Muddle Cocktail was born, and what a drinks party it was! You can purchase the drinks as our Midsummer Muddle Cocktail Set as pictured. This drink is designed to be made up in a large pitcher or jug and drunk long in high ball glasses. Add a good quantity of ice to a jug with a squeeze of fresh lemons and slices of lemon and cucumber. Add measures of Morello Cherry Brandy Liqueur 17%, Somerset Pomona 20% and Seville Orange Gin 26%. Top up with lemonade. Serve with additional ice in tall glasses. If you would like add a little extra style to your cocktail, add some of our whole Morello Cherries in Apple Eau de Vie 20% to your cocktails. Our Raspberry Vodka Martini was first created in 2004 when we launched Demijohn in Edinburgh's Grassmarket. It has since become a bit of a Demijohn classic cocktail. Like our popular Raspberry Vodka Liqueur 22% when drunk on its own over ice, the Raspberry Vodka Martini is a very good cocktail to get a party going. And best of all, it is so simple anyone can make it! Finally, twist a small amount peel from a fresh lemon over the glass and drop into the drink to give your Martini a zesty twist. A further garnish of a slice of lemon can be added to the side of the glass for decoration. The taste of Morello Cherries are not for everyone. However, if you are a cherry lover and like a slightly sweeter drink, then our Morello Cherry Martini is definitely worth a try, it is utterly unique. Our delicious Morello Cherry Brandy Liqueur 17% gives this Martini its fruity and sweet taste, while our dry and smooth Demijohnnie Gin 50% and handmade Dry British Vermouth 18% both combine to drag this drink in a completely opposite direction. The result is a very sippable Martini Cocktail indeed. Finally, slide a few Morello Cherries soaked in Apple Eau de Vie onto a cocktail stick and balance on the side fo the glass. If your Morello Martini fails to have an effect on your guests, simply encourage them to try one or two of their Morello Cherries and wait for the fun to start! If you are a rhubarb fan then our Rhubarb Bellini Cocktail will be your drink. Its creation, using our very popular Rhubarb Vodka Liqueur 20.5%, marked the launch of our new Demijohn Cocktail Bar in a muddy field at Scone Palace in Pertshire, Scotland in early July 2012, (well we needed something to raise morale in the rain!). This is a long drink that should be ideally served in Champagne Flutes or another similar tall glass. Stew fresh rhubarb stems for about 5 minutes and sweeten generously with sugar. Liquidize the stewed rhubarb with a blender into a smooth paste. Chill for an hour prior to adding 2 teaspoons full of the fruit purée to the glass. 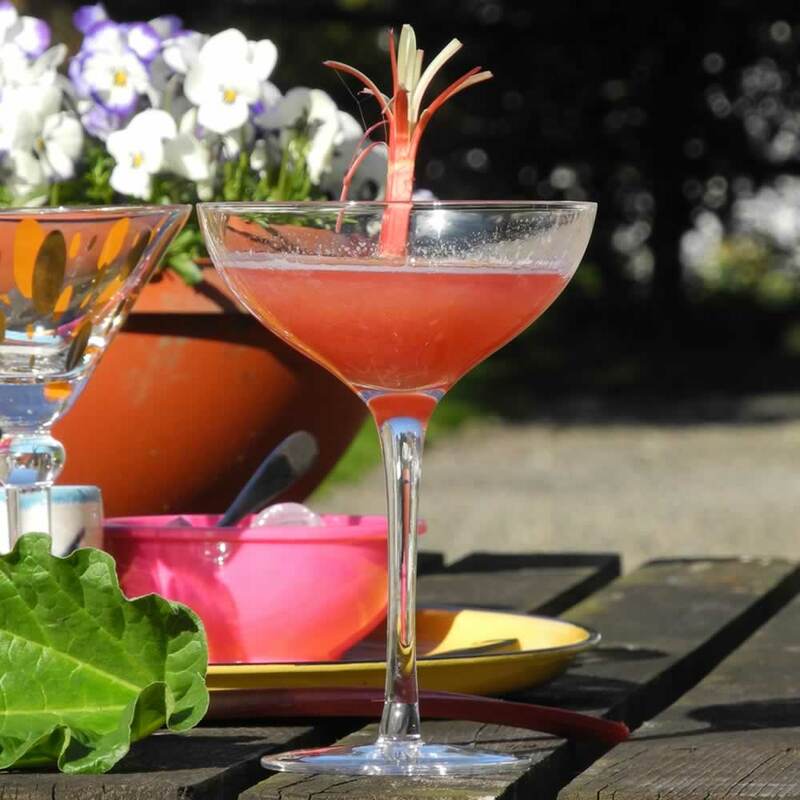 Add a measure of Rhubarb Vodka Liqueur 20.5% and top up with chilled Prosecco or Sparkling White Wine. The original Bellini is a long cocktail drink that originated in Venice in the 1930's. It is a mixture of sparkling wine (traditionally Prosecco) and peach purée often served at celebrations. It is one of Italy's most popular cocktails. Our Rhubarb Bellini's proved to be so popular our customers soon forgot the rain and the mud at Scone Palace and really got in the swing of things! Sometimes simple flavours pair together in the most magical way, and such is the case in our deliciously fresh tasting Raspberry Fresh Cocktail. Combining our seriously fruity Raspberry Vodka, zesty Lime Vodka Liqueur and fresh apple juice, this drink can make a long and refreshing way to start a warm summer's afternoon or a night on the tiles. Mark and Tim in our York shop have had some great ideas for mixing our unique selection of handmade British drinks, but this is one of their best so far. Be warned however, our Raspberry Fresh Cocktail is so easy to drink it might make you rather fresh too! This cocktail is dedicated to our Demijohn boys in York, Mark Perkins and Tim Fox. They have created a great cocktail drink using our hugely popular Raspberry Vodka and Spiced Rum liqueurs to create a big, strong tasting drink for men. If you like Vodka and Rum then this is your cocktail. Very simple. Pour equal measures of Raspberry Vodka Liqueur and Spiced Rum Liqueur over lots of ice in a rocks glass. The Raspberry Vodka, or Bloody part of this drink, conveys a fruity taste while our Spiced Rum, aka drink of Pirates, adds a rich caramel treat. The result is cracking cup to start any Summer party! The Bloody Pirate is a ready made gift set, a great present idea for men! Our handmade Damson Gin Liqueur is smooth and fruity when drunk straight. Sharpened up with a little lime turns this drink into a deliciously refreshing aperitif. Muddle a chopped fresh lime and some blueberries in a rocks glass. Add a large (50ml) shot of our Damson Gin, stir, and top up with crushed ice. This dring can also be made with great effect using our Traditional Sloe Gin. Blow your friends away with this one! Garnish with a slice of lemon, serve over ice. The Pink Gin was invented by the British Navy, and the inclusion of our blackcurrant vinegar: a favourite food of blackbirds, and a fruit reminiscent of summer puddings, seems to celebrate its very Britishness - hurrah! This is a very good cocktail for you to get your Burns Night Supper festivities off to a cracking start. Strain over ice into a chilled high ball cocktail glass and serve. While your guest are consuming your fine cocktail, take your chance to perform Burns' famous Tam O' Shanter poem for them and simply await their applause. Please note, it may take more than one cocktail! All credit for this little genius of a drink goes to our erstwhile Edinburgh Shop Manager, Alastair Simpson. Always one to appreciate a good thing, Alastair seems to have found a way of spicing up Oz Clarke's favourite liqueur from Demijohn, our Bramble Scotch Whisky Liqueur, and making a good drink even better. The rich fruity taste of Brambles (or Blackberrys) in the liqueur make this drink seriously fruity with a bloody big punch of whisky! Shake and serve in Boston shot glasses. For Sloe Gin Liqueur lovers this is a must to try. It will wake any party up with is freshness! Squeeze the lime juice directly into a highball glass half filled with ice, add spent shell and Sloe Gin. Mix with spoon and add soda. Our Sloe Gin 25% can be replaced by our Sloe Sherry Liqueur 18% to make a Sloe Sherry Rickey which is a slightly lighter drink!